Hello delicious, healthy, good for you, comfort food! These veggie noodles are smothered in a sauce that is delicious, creamy, coconuty, peanuty and oh so good! 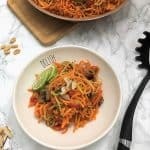 This recipe replaces traditional noodles with veggies, so you can enjoy your favourite pasta dish, without all the carbs and calories. So go ahead and have seconds! This wholesome dish will leave you feeling completely guilt free, and 100% satisfied. How to prepare your veggie noodles? To prepare your veggie noodles, you’ll need a spiralizer of some sort, or you may also use a mandolin. Before I bought my Veggie Bullet which I absolutely LOVE for spiralizing vegetables, I used a mandolin to make vegetable noodles. It definitely works, but it is a lot more time consuming! (Not to mention the extreme caution you’ll want to use if preparing these with a mandolin.) 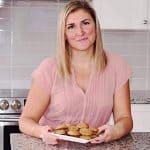 There are a ton of different spiralizers out there, and I’ve tested out a few of them and the Veggie Bullet is definitely my favourite. It’s easy to use and fully automated, providing evenly cut noodles. 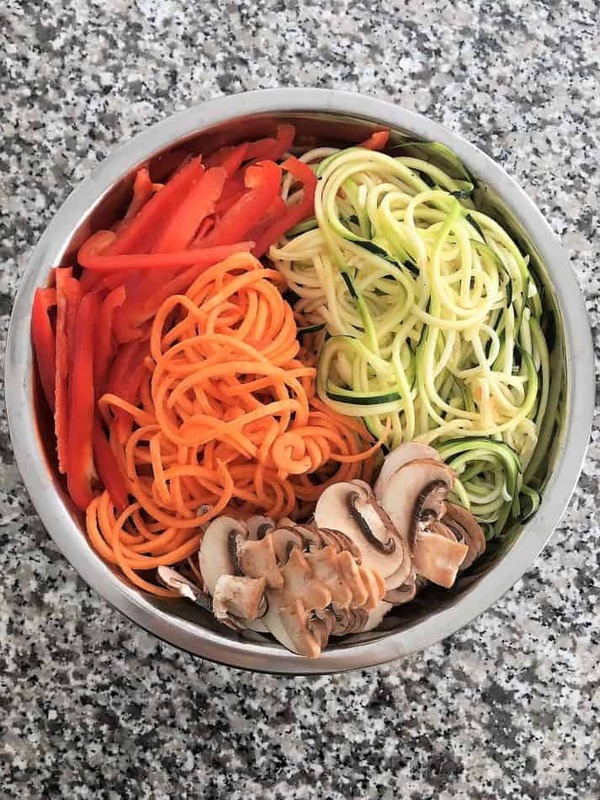 Once you spiralize your zucchini, sweet potato and carrots, thinly slice your mushrooms and red pepper. Then add all the veggies to a large non stick skillet and cook for about 6-8 minutes until softened and heated through. Do not overcook the vegetables. While the veggie noodles are cooking, add all your sauce ingredients to a small sauce pan. Heat only until warm. No need to cook out any of these ingredients, making it a super quick sauce you can have ready in minutes. 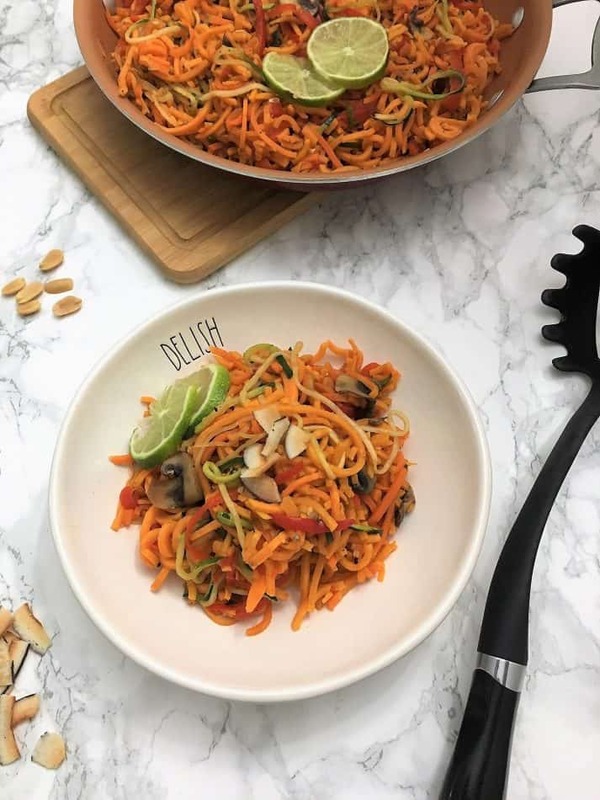 Transfer your cooked veggie noodles into bowls or plates, then top with the sauce and extra peanuts, coconut, or lime wedges if you please. There you have it! 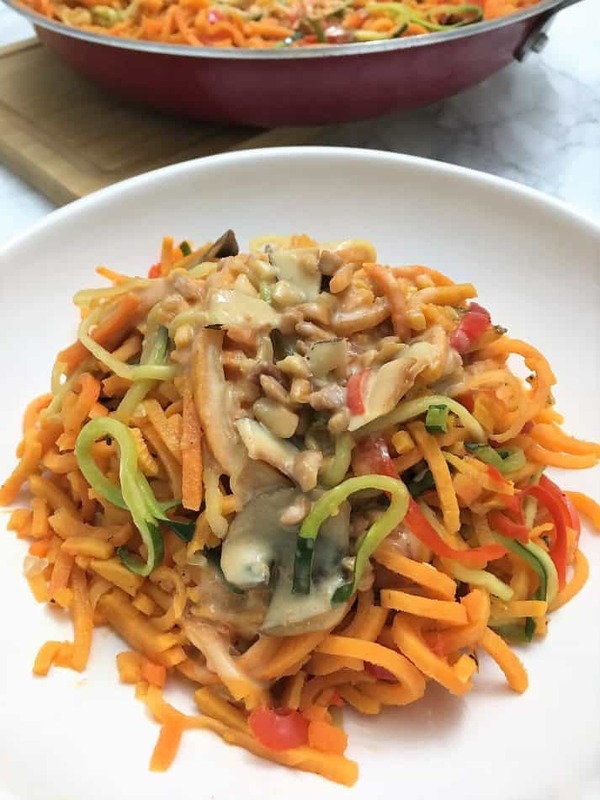 Easy, peasy, veggie noodles, smothered in a rich and flavourful coconut peanut sauce. This easy recipe is perfect for your busy weeknights, ready in less than 30 minutes! Plus, it’s vegan and gluten free, making it a suitable choice for any diet. AND it’s low in calories, but will leave you feeling full and satisfied. If you enjoy this recipe, you may also want to try these! Creamy, coconuty, peanuty, amazing veggie noodles are delicious and wholesome! Plus low in calories for a guilt free meal! Add all your vegetables to a large non stick skillet Sprinkle with salt and pepper and cook over medium heat until softened, about 6-8 minutes. Meanwhile, combine all your sauce ingredients in a small sauce pan and whisk until combined. Heat your sauce until warm, but no need to cook. Then pour your sauce over your vegetable noodles and serve garnished with lime, crushed peanuts, sesame seeds or shredded coconut. I need a Veggie Bullet! 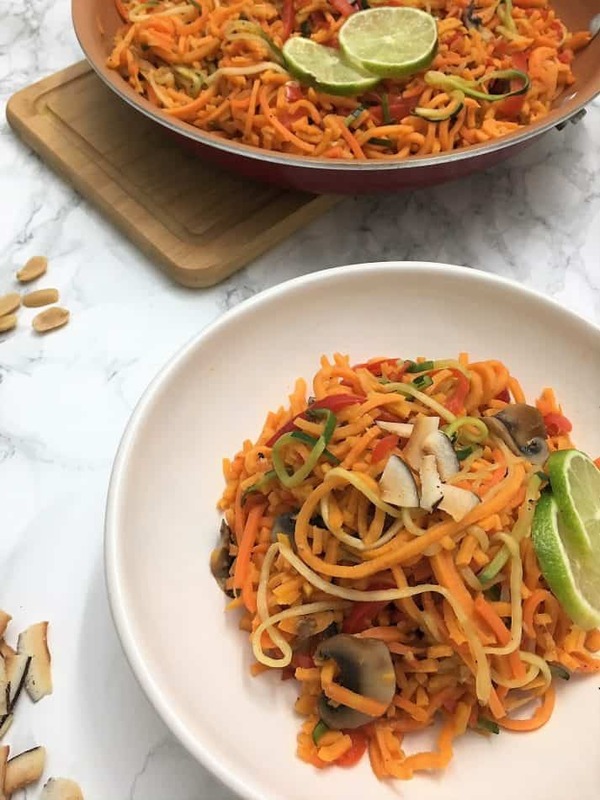 I need to be able to make sweet potato noodles like these! Like your bowl says, “Delish”! Thanks Jillian, it really makes it so easy to make veggie noodles! Wow! This veggies noodles looks so colorful. I am gonna try it soon. Thanks for the lovely healthy share. You’re welcome Meghna, hope you enjoy. I LOVE anything with coconut, these noodles look sooo good! And the flavours sound amazing. I know what I’m having for lunch tomorrow! Thanks Suzy, hope you enjoy! This sounds delicious! I may just have to make all 4 servings for me 🙊 since my family is not a huge fan of coconut milk! !